With fall arriving, the season for outdoorsy expeditions comes with it. And if the autumn breezes are calling you to a bike ride through the woods or the mountainside, you’re going to need a way to get all your gear to the trail. Depending on what exactly you’re hauling out, as well as how you’re doing the hauling, there are numerous options for different rigs and setups to get all of your equipment transported securely. For a more in depth look, REI has a comprehensive comparison of all the pros and cons of each option, within its collection of “Expert Advice” articles. One of the most basic and functional options for transporting bike gear, as well being one of the least expensive, is the trunk-mounted rack. 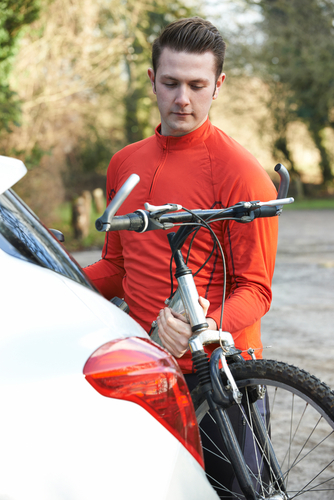 These racks are lightweight, easy to use, and can typically secure two to three bikes to the back of your car. Many are collapsible or otherwise easy to store away when not in use. On the downside they might get in the way of trunk access while affixed. Trunk racks are easy to apply and remove, so they are great for regular or infrequent use. A high quality option for trunk-mounted racks is the Thule Raceway PRO 2, sporting adjustable arms which secure it to the vehicle in place of more standard nylon straps. For additional functionality try hitch-mounted racks. These are often easier and simpler to attach, and on average carry more bikes and accessories than trunk-mounted racks. They are also very secure which can help reduce the chance of scratches to your car’s paint job. A versatile and high quality hitch rack is the Thule Vertex, capable of holding a variable number of bikes and with foldable arms. Another highly rated and efficient hitch rack is the MaxWorks 70387 Black Hitch Mount Platform Style Bike Rack, which is less expensive although only caries one bike. For more permanent fixtures, roof-mounted racks provide more storage space for any biking gear you might need to haul around, and sport enough versatility to carry other kinds of gear as well. They are more costly, some people find them more difficult to set up, and they produce more wind resistance than the rear-mounted options, but offer much more variability and customization to the rig. Due to the variable nature of roof-mounted racks, there are many options for customization. Thule and Yakima are highly rated brands to check out while researching a roof-mounted rack system for your vehicle. And if the fall has something else entirely in store for you, roof-mounted cargo boxes provide more general purpose storage for just about anything else you might need to take with you. They are fairly permanent fixtures meant for more frequent use, but their versatility and protection are greater than that offered by the other rigs.